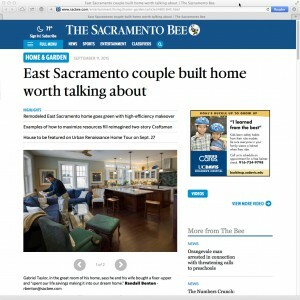 This remodeled East Sacramento home received a “green” high efficiency upgrade with several unique energy-saving features. This home was also featured in the 2015 Urban Renaissance Home Tour . Read more about it in thisThe Sacramento Bee Home & Garden feature. Over several informal meetings with their design and construction team, the new-old house took shape. The original nondescript bungalow was taken down to its foundation to be replaced by a two-story, four-bedroom, 21/2-bath Craftsman-style family home with 2,250 square feet of living space.